Sri City, June 5, 2018:- Sri City, one of the largest integrated business cities of the country, with its strong commitment to sustainable growth and environment safety, celebrated World Environment Day on Tuesday. The week long awareness campaign on this year’s theme ‘Beat Plastic Pollution’ and the mitigation activities, culminated in a concluding session held at the Business Centre. Mr. R. Muthuraj, ITS, Development Commissioner, Sri City SEZ, who was the chief guest of the concluding session, urged the community to reduce the excessive use of plastics and explore sustainable alternatives. Mr. Satish Kamat, President (Operations), Sri City gave a lucid presentation on Plastic pollution and the threats on the future of our planet. Dr. Venkat, Head, Environment Division, Sri City presented a report on the week long activities that were organised involving the Sri City community and the public in the vicinity of Sri City. Mr. C. Vijaya Bhaskar, Customs Specified Officer in his speech underscored the need for using the biodegradable material. Mr. Suresh, Kellogg’s industry gave a presentation on the best practises of managing plastic waste in their unit. 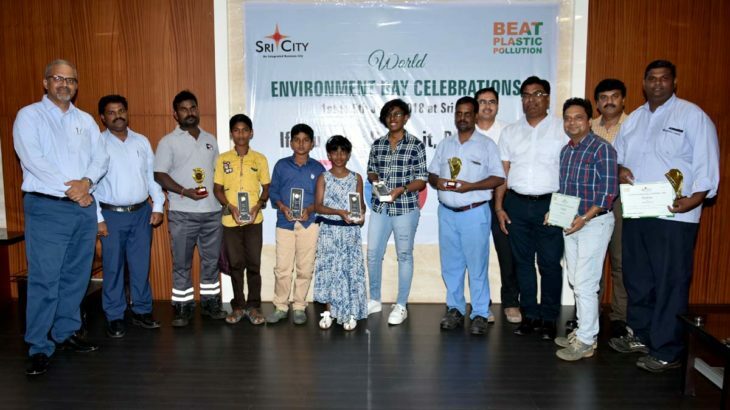 World Environment Day celebrations in Sri City commenced on June 2nd, with a large number of employees, students and general public of the neighbouring villages, enthusiastically coming together to collect and dispose plastic waste in Sri City and in the surrounding villages. To create awareness among the people, banners and display boards were erected, appealing the public to consider how changes can be made in everyday lives to reduce the heavy burden of plastic pollution on the environment. Drawing competition and slogan writing competition for students and employees were also held. Mr. Muthuraj and other dignitaries distributed prizes to the winners of competitions.